When you are looking to cut out gluten from your diet, flour is the first thing you might want to substitute. There are many gluten free flours to choose from these days. So it is a lot easier to remove the common white and wheat flours, which have been bleached and contain gluten, from your diet. Below is a list of the top nine gluten free flour alternatives below. Coconut flour is high in nutrition and is especially great if you’re going onto a gluten free, paleo, vegan or lower carbohydrate diet. The fats contained within coconut flour are easily absorbed in the body, converting it to energy and stabilising blood sugar levels as well as supporting a healthy metabolism. Tapioca is a type of starch extract that’s derived from a starchy root vegetable called cassava (sometimes called Yuca root). If you have an allergy to nuts, coconut and other gluten-free grains, or you are following a FODMAPS or gluten-free diet, then you’ll discover the versatility of tapioca flour. 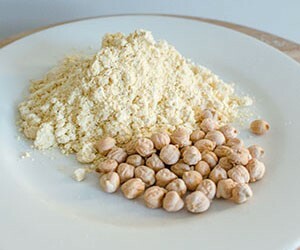 Chickpea flour is also known as garbanzo bean flour and besan flour. Chickpeas are legumes and are a staple ingredient in Indian, Pakistani, Nepali and Bangladeshi cuisines. Chickpeas have calcium and magnesium in an ideal ratio, are high in folate, B vitamins and potassium, as well as antioxidant minerals such as iron and selenium. You can use chickpea flour in place of regular wheat or other gluten-free flours in dishes like falafel, pancakes, pizza crusts and crackers. Try chickpea flour in a family favourite like rissoles. It works well in cakes or breads too. Despite its name, buckwheat actually doesn’t contain any wheat or the protein gluten. For this reason, it’s used in many gluten free baked items to add bulk and nutrients without causing allergies or digestive issues. Buckwheat flour is a favourite amongst plant-based and gluten free eaters since it provides a high source of amino acids, vitamins, minerals and antioxidants. A major benefit of buckwheat it that it can help to aid digestion, relieve constipation, lower cholesterol and reduce hypertension. Buckwheat contains roughly 13g of protein for every 100g, which isn’t as high as quinoa or legumes, but is higher than most whole grains. Buckwheat also provides two essential amino acids called lysine and arginine. Your body cannot make these and must get them from food, so buckwheat flour is a perfect source for this. You can grind raw buckwheat groats in a high-speed blender or Thermomix to make your own fresh buckwheat flour. Store it in an airtight container or in the freezer to extend the shelf life even further. Buckwheat flour is great for making baked goods like cakes, muffins, pancakes, cookies and muesli bars. Quinoa flour (pronounced KEEN-wah) is another fantastic flour for vegans and those following a gluten free diet, and is often considered a superfood. It’s packed with vitamins and minerals such as magnesium, iron, B Vitamins, zinc, calcium and potassium. 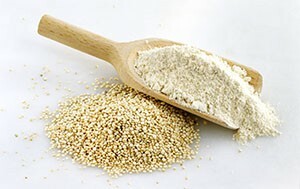 Quinoa is one of the few grains that contain all nine of the essential amino acids. Most grains are considered incomplete proteins. However, quinoa contains lysine, as well as all of the eight other amino acids, making it a complete protein, similar to animal proteins. One of quinoa’s other health benefits is that it’s rich in insoluble fibre, which is essential to maintain a healthy digestive system. It contains approximately 5g of fibre per cooked cup of quinoa. If you want to make your own quinoa flour take 1-2 cups of organic quinoa and toast it in a frying pan until it starts to pop. Keep it on the heat and stir it occasionally for 1-2 minutes, then allow it to cool completely. 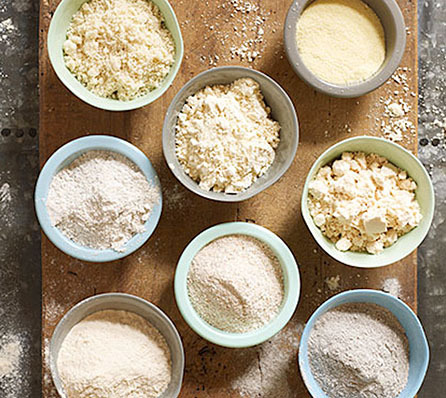 Mix in a high quality food processor until it resembles flour. Store in an airtight container or in the freezer to extend the shelf life even further. Rice flour is non-allergenic for a lot of people, as most people digest it well. If you’re hesitant to give up wheat based pastas, then rice pasta is probably the best pasta alternative for you to eat. You can store it in an airtight container in the freezer to keep it fresher and to extend the shelf life too. Almond flour is probably the easiest flour alternative to use, making it a fantastic gluten free baking alternative to make recipe favourites like cookies, cakes, muffins, slices and other baked goods. ½ cup of almond flour contains – 28g fat, 12g protein, 12g carbohydrates and 6g of fibre. Almond meal is also packed with magnesium, copper, calcium, potassium and manganese. Almonds have been found to support skin health, healthy brain function, control blood sugar levels as well as support a healthy metabolism. When the skin is left on the almonds and milled into a flour/meal, it contains probiotic components that help with digestion, detoxification and healthy bacterial growth within the gut flora. Here are a few recipes – cinnamon cake, spiced granola and paleo almond bread. We recommend avoiding almonds if you have a known nut allergy or sensitivity. This may seem like a bit of a strange suggestion, but trust me it’s a fantastic flour to experiment with when making baked goods. Banana flour is made from green bananas and it’s often used as a gluten free replacement to wheat flours. It’s vegan, paleo and FODMAP friendly. Banana flour is full of natural vitamins and minerals and is a rich source of potassium. This type of flour is also a fantastic source of resistant starch (68% rich), meaning it is not digested in the small intestine. It ferments in the large intestine which feeds our microbiome, improves digestion and has many other health benefits like helping to manage Type II diabetes. The high resistant starch content means that you need less banana flour than you would if you were using normal wheat flour. Banana flour can behave quite a bit like coconut flour, it’s also highly absorbent and can dry out baked goods it too much is used. We generally recommend using roughly ¾ cup to every 1 cup of wheat flour. Sunflower seeds provide a healthy source of essential fatty acids called linoleic acid. They are also an excellent source of fibre, amino acids (especially tryptophan) which make up the building blocks of proteins, B Vitamins and phytosterols. Sunflower seeds are one of the best natural sources of the antioxidant Vitamin E, which works hard to fight against free radical damage in the body. It’s also a rich source of copper, magnesium, selenium, folate and manganese. If a person is gluten-free, vegan, paleo or allergic or sensitive to almonds and other nuts, milling sunflower seeds into a nut meal/ flour using a food processor or Thermomix is the best gluten free and nut free alternative. Try this simple recipe – spring onion and salmon patties. Comment below and share if you have any other favourite gluten free flours, gluten free flour mixes and recipes that you love. Here’s a recipe for an all purpose gluten free flour mix. Click here for more gluten free flour alternative recipes on the Changing Habits website. I like millet flour. I use it for sauces mostly and it has a mild pleasant taste. I mostly buy it milled but sometimes can get the millet and mill it myself in the Thermomix. I don’t know how healthy it is compared with the other flours though. 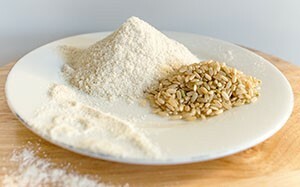 Hi Catlyne, millet is another great GF option to utilise, and I agree with you, it is so easy to mill it in the thermomix until it resembles a fine flour. You can do this with a lot of other GF grains too, such as quinoa, buckwheat, amaranth and rice. I’ve read that tapioca and arrowroot are different products. Also that tapioca is a goitergen which I need to avoid. Thank you for this clear, concise and very helpful list of flours. Great help! Helpful list,thanks.I am concerned about quinoa however, as I live in the US. Here it is hybridized and contaminated by wheat, so unfortunately the GF alternative goes out the window. It’s no longer the ancient grain with the same nutritional profile. Grainfree options are safer for gluten free diets. Wow that’s really interesting to know about the quinoa in the US being contaminated by wheat, thanks for sharing. I’m sure some of our American audience would not know this, so now they can be more aware. Yes there are definitely some people with specific health issues that do need to avoid all grains and pseudo grains entirely. Thank you so much for the continued effort to get some justice to the little people. Personally I have been plagued by issues all my life, some identified and then slipped back again. This time I am determined to succeed. Don Chisolm’s book Have you got the gut to be really healthy? has been instrumental in getting my husband to start appreciating what I have been talking about for years. Once again to the team… we need many more to come on board “the good food train” for the sake of our children. Great article!! If we use any of these flour substitutes do we use the same amount of the substitute as the flour in a recipe? Can not wait to use these, thank you so very much. Hi Jan, if you are new to these flours and have not used them in baking before (for example coconut flour), then I would suggest following a recipe, as it is not as simple as swapping the same ratio of wheat flour to coconut flour. Coconut flour is a lot more absorbent then regular wheat flour, so you need less due to it sucking up a lot of liquid. This is a great start, but there are so many more! I use cassava flour to replace tapioca or arrowroot in recipes that call for them; it is almost as light, but contains more nutrients. Others flours to use are chestnut, sesame seed, flaxmeal, teff, psyllium seed, bean and pea, various rice flours, and in certain recipes, cacao. Their utility depends on what you’re making and exactly what your diet permits (Paleo, autoimmune AIH, low-carb, etc). No single resource I’ve found is complete, but these 2 are pretty good! Where do you get your teff? 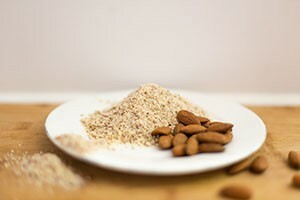 What is the difference between almond meal and almond flour if any? I’ve always thought they were different and that almond meal is ground almonds? Is almond flour the ground dehydrated leftover pulp from making almond milk? and is coconut flour the ground dehydrated leftover pulp after making coconut milk? This is what I have been doing, i.e. grinding the dehydrated leftover pulps in my Thermomix until fine. Hi there Janie, Thank you for your questions. Thanks for the info. I’m glad to know that you didn’t include potato starch and corn. I have been using Teft. I grind it in the thermie and replace the millet in Cyndi’s GF bread. It is yummy and gives the bread a more darker and different texture.